We all know the feeling of waking up with a start, but we don’t always know what we were dreaming when that happened. Andrew Basso, a Grade 11 student at Dr. G.W. Williams Secondary School, didn’t have to dig too deep in trying to remember a nightmare. His nightmare involved lying in the middle of the road, unable to move other than to roll, with a big truck coming straight towards him. 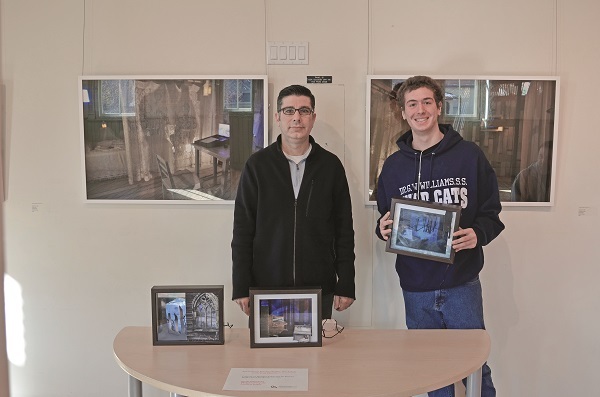 He always woke up before knowing whether he was able to roll to safety, but the image stuck with him – and it is one image in which he had the chance to dig deep as one of three area students working with Aurora artist Troy Hourie on his latest exhibition Apparitions. Apparitions, which wrapped up Saturday at the Aurora Cultural Centre, was billed as “an immersive mixed-media installation composed of The Bed, The Attic and The Writing Cabinet” inspired by Benjamin Britten’s opera The Turn of the Screw. Bringing in a collection of found – and often macabre – objects, married with video components and other interactive displays, it was an installation in which viewers could fully put themselves in the middle – and thanks to a grant from the Ontario Arts Council, Mr. Hourie was able to take some students along for the ride. Mr. Hourie facilitated two workshops to coincide with Apparitions which allowed the three participating students – Basso, along with Meagan Puopolo and Jacob Shwarze – to explore the creative process and their interaction with space and technology and create their own “cabinets of wonder” hinged on the themes of dreams and nightmares. “The important part of this workshop became about explaining the term ‘intermediality’, which is a way of working where it means the connections of the body moving in space, interacting with tools, whether pencils, projections, or paint, and creating an artwork,” Mr. Hourie told The Auroran on Saturday at a mini-exhibition allowing the three students to show off their work alongside the larger installation. “It can be for theatre, it can be for architecture and the visual arts, it is a very broad practice and there aren’t a lot of us who practice right now. When Andrew first learned this exhibition was called “Apparitions” he immediately thought of ghosts and other spooky things, but was intrigued when he learned it was more about nightmares and dreams. The image of the truck coming towards him as he was stuck on that road is one image he couldn’t shake and this feeling of being “stuck” was represented in his work, which features images of an individual swimming and stuck in the middle of a wave, and another person, also stuck, hanging above. A techie guy at heart, Andrew said he particularly enjoyed working with the video technology components Mr. Hourie brought into the process, and is now eyeing a possible future with possibilities that flex his creative muscles. “It was just so much more fun because you can create your own thing,” he said, comparing the artistic process against math and science, his two academic specialities. “You’re not following a set of rules, so moving forward I like the narrative that we made with the video and stuff like that. I loved making narratives and creating things that people are interested in.